with Daniel A. Hughes Ph.D.
Parents and professionals now have the opportunity to join Dr. Hughes as he teaches a workshop on the method of Dyadic Developmental Psychotherapy. This is a great tool for all who live and work with adopted, foster or biological children with truama-attachment disorders. Watch the DVD and learn how to understand these children who have lived in traumatic situations. Learn how to parent these children differently and more effectively. Learn how to explain your child to other professionals. Learn how to explain these children with trauma/attachment difficulties to parents, foster parents and adoptive parents. The CD is a direct audio of the DVD. 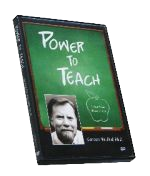 The DVD gives you graphics to support the learning which is invaluable. The poem is illustrated in the DVD which makes it much more powerful for audiences and personal learning. DVD is available for $75 plus shipping and handling. CD is available for $20 plus shipping and handling. Buy two sets of DVD's and get the CD free. With Dr. Daniel A. Hughes Ph.D. 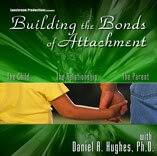 This three part DVD series demonstrates Dr. Hughes' attachment-focused treatment model with six different families. The first DVD demonstrates two sessions with adolescents and their parents. 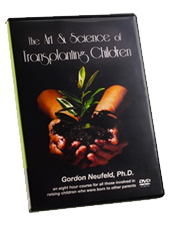 The second DVD focuses on therapy with children and their parents. The third DVD consists of sessions with parents alone. Each DVD is about two hours in length and has two treatment sessions and a brief description of each session. Part 1 includes a 20 minute presentation of the treatment model, with one of the treatment sessions being edited to 40 minutes. The sessions are very realistic, while using amateur actors and actresses. This two-DVD set contains over three hours of material describing how to assess parent capacity, which will be useful for those working with adoptive and foster parents. The DVD describes: factors associated with placement stability specific methodologies to assess commitment parent state of mind with respect to attachment insightfulness & sensitivity. The DVD contains video clips of actual evaluation sessions to demonstrate the principles. Psychologists, social workers, mental health professionals, child welfare workers and others who work with children in the child welfare system will find this DVD of value. 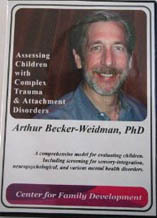 Using lecture, PowerPoint, and actual clips of evaluations of children a method for assessing complex trauma and attachment disorders is presented. 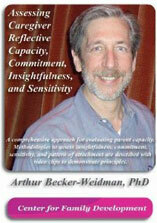 Training DVD about Dyadic Developmental Psychotherapy, an evidence-based, effective, and empirically validated treatment. 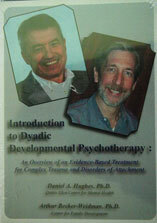 The DVD is presented the trainers certified to offer training by the Dyadic Developmental Psychotherapy Institute. The DVD begins with an overview of Dyadic Developmental Psychotherapy, its core principles, phases of treatment, and core components of treatment. The last two DVD's in the set present actual video of treatment sessions to demonstrate the principles of treatment. Included are a psychodramatic re-enactment, a session with a single foster mother and teen, and other families. The ATTACh Therapeutic Parenting DVD is designed to be used in support group settings and by therapists in the training of caretakers. The six-hour DVD follows the topics introduced in ATTACh's book Therapeutic Parenting: A handbook for parents of children who have disorders of attachment. The accompanying Study Guide can also be used as a springboard for discussion of the issues and techniques presented. The four presenters are therapists and parents who live and work with children who have disorders of attachment. This DVD will help parents, family members, educators, and others learn to support children on their path to healthy, loving, and trusting relationships. The price of a DVD/Training Set (6-hour DVD set, Therapeutic Parenting Guide/Handbook & Study Guide) is $75.00 plus $8.00 shipping and handling in the US, $10.00 to Canada or $20.00 for international orders. Discounts are given for orders of 25 or more copies. Please contact ATTACh at questions@attach.org for further information on bulk orders. We are most pleased to announce the release of this videocourse. From early reviews, the response is enthusiastic. One counselor in the adoption field who previewed this course proclaimed �It was a wonderful course and the material was laid out the best of any of the courses to date�. Over the years, Dr. Neufeld has done a lot of work in the adoption and foster communities and his hope is that with this course, he can make a significant contribution to this challenging arena. This course is primarily presented to parents and supporting professionals in the foster and adoptive communities but the content also applies to step parenting as well. This course is also suitable for the support cast of surrogate parents: teachers, grandparents, uncles and aunts. The impact of attachment disruption, even when in the best interests of the child, can be deep and profound, interfering with even the most loving and skilled attempts to raise the child by foster parents, adoptive parents or step parents. When such children fail to adequately re-attach to the parent or parents who are raising them, or who are unable to recover from the impact of the attachment disruption, nothing works as it should. Our practices with such children need to be founded on a solid knowledge base of their attachment needs and of the effects that attachment disruption can have on subsequent development and receptivity to care. Transplanting children - whether the result of remarriage, adoption, parental loss, removal, or change in custody - constitutes the most difficult challenge in raising children. Like plants, it is all about their attachment roots; unlike plants, it is a great deal more complicated. Teaching is getting harder, not easier. This despite the fact that teachers have never been more educated, technology has never been more advanced, curriculum has never been so refined and pedagogy has never been so honed. Although these factors are important, the true problem in schooling lies elsewhere. Dr. Neufeld has been joining the dots for over 35 years and has concluded that the power to teach is being eroded in today's society. In his insightful analysis, Dr. Neufeld uncovers four natural sources of power and reveals the handicaps that result when these are missing. He exposes the reasons why today's teachers more than ever need to harness the power of attachment to do their jobs. He also provides practical suggestions on how to do this. Educators who have been exposed to this material have found it most inspiring and helpful. Group facilitation requires certification. In this 4.25 hour videocourse, Dr. Neufeld sheds light on this dark side of human nature. This refreshing developmental analysis of bullies reveals instinctive roots embedded in the dynamics of attachment and the flight from vulnerability. The implications for intervention and treatment are profound and largely counter to prevailing approaches. 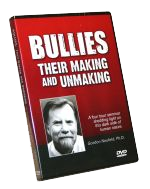 Invited to keynote on Canada's first national conference on bullying, Dr. Neufeld shares the insights that have evolved as a result of years of experience working with bullies of all kinds, combined with his mastery of the developmental literature. Group facilitation requires certification. Please consult the training page for details regarding facilitator training and certification. The videocourse can be divided into four sessions for group study.